In my watch collection effort, I like to have themes. The theme guides the delimitation and makes for a good storyline. This theme is my first and focuses on flight and space, and I have tried to get each watch to represent a particular decade, in this case 1910's to 2000's. Disclaimer; I know this is a military watch forum, yet the last two watches in the series are civilian. However, I hope you will forgive me, as the manufacturer has a indisputable track record of military issued watches, and in my humble opinion, it is one of the greatest. 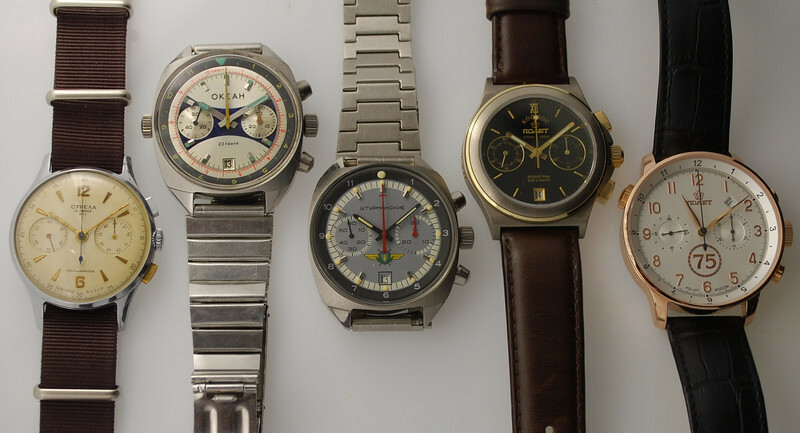 All the watches are essential to the story line I am trying to communicate. The 1910's to the 1950's. The 1960's to the 2000's. Hy. 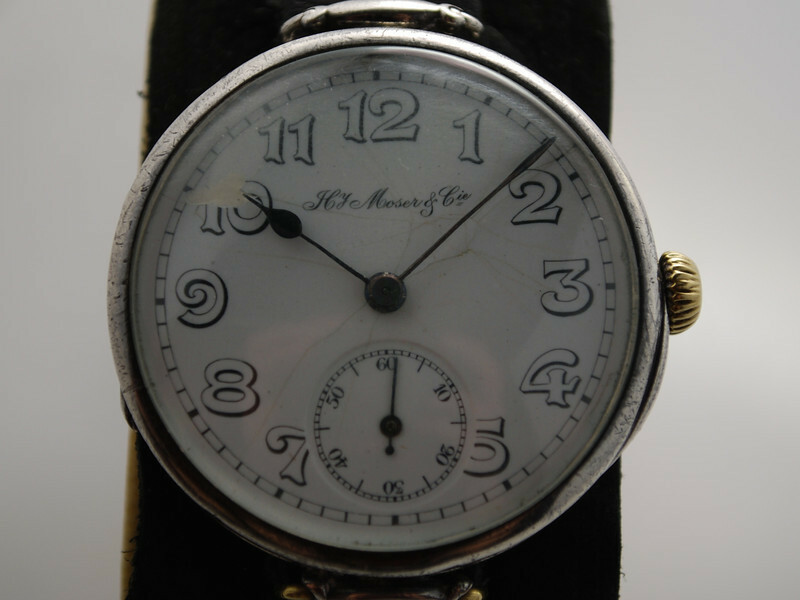 Moser & Cie from the 1910's. This is an imperial watch with a case in solid Sterling silver. Gostrest Tochmekh from the 1920's. 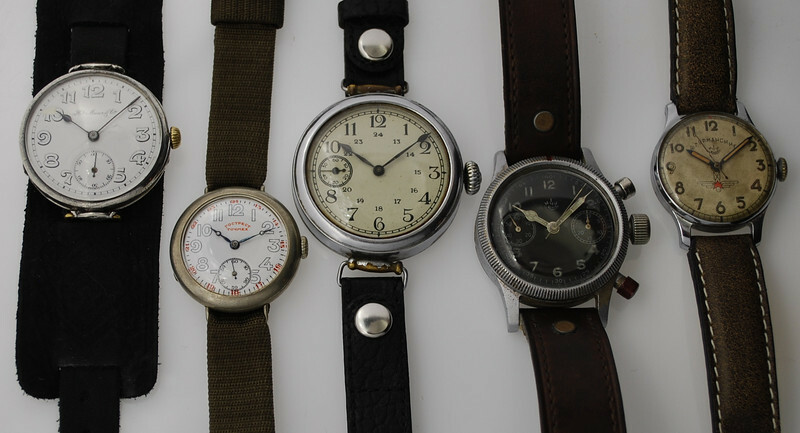 Among the oldest Soviet watches there is. Movement is Swiss made: Unitas 146. 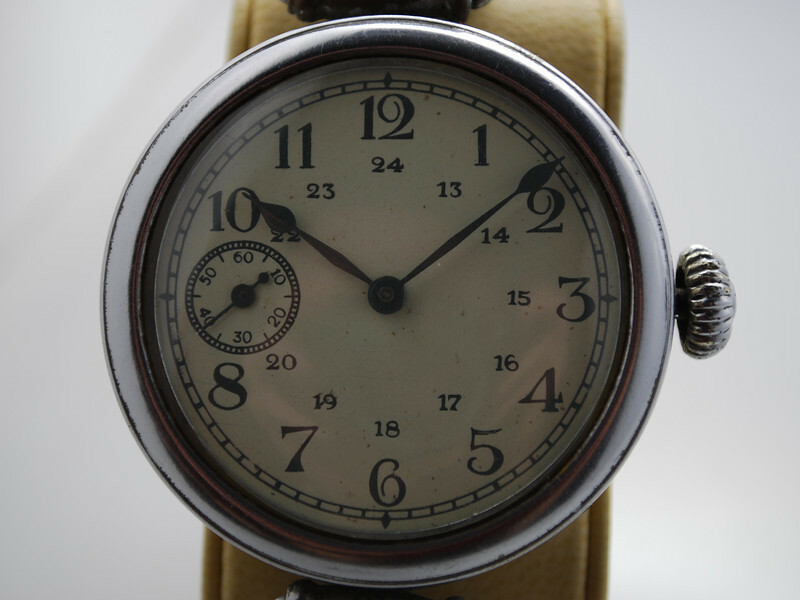 Here is a K-43 watch from the Second Moscow Watch Factory from the 1930's (1939 to be exact). 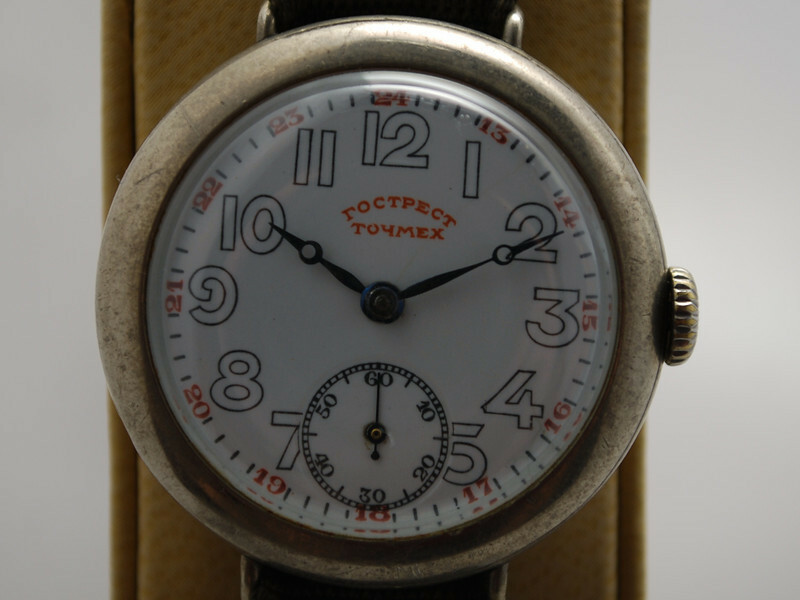 The movement is the famous Type-1, the first to be manufactured in the Soviet Union. The Kirova Type-59 represents the 1940's. The Shturmanskie represents the 1950's. This one is a very early model and is actually from 1950. It became famous when Gagarin took it for a spin in the worlds first manned space flight in 1961. This Strela represents the 1960's. This particular one is from 1962. 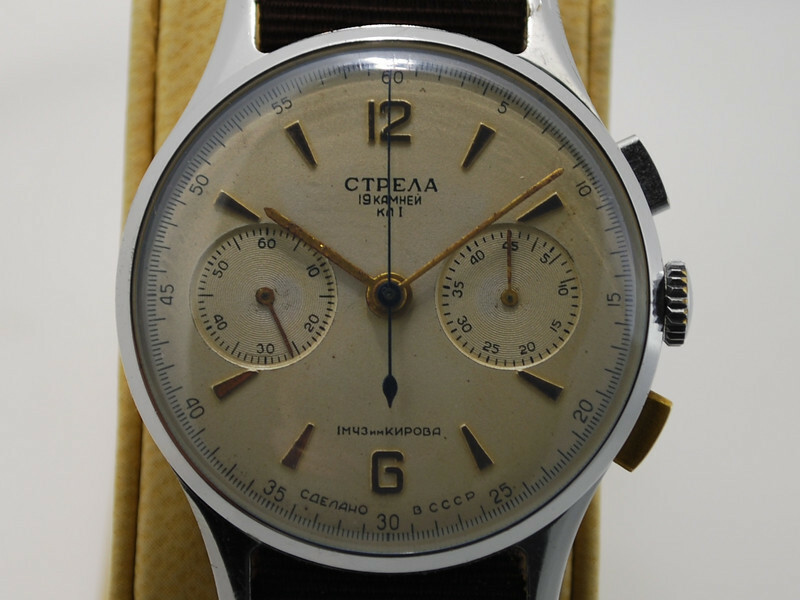 The Strela became famous when Alexey Arkhipovich Leonov became the first human to conduct a space walk in 1965, wearing a Strela. 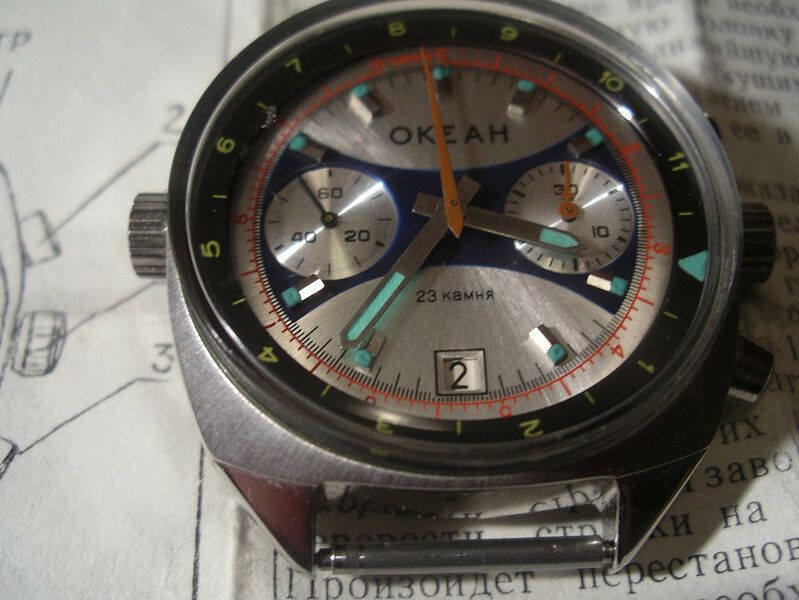 The OKEAH (ocean) stands for the 1970's. It was the first watch with the 3133 movement, which is actually still in production. The watch was initially used by the marine, but was later used in the space program as well. 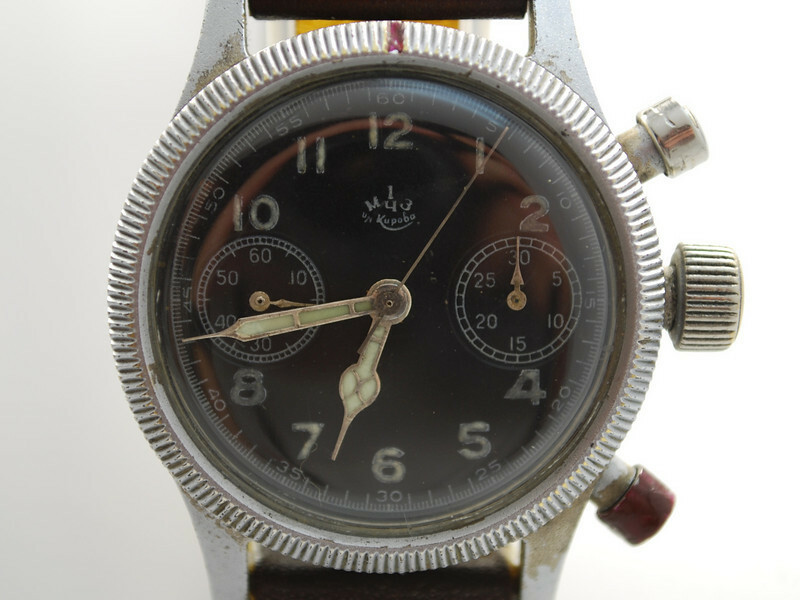 The exact manufacturing date of this watch is unclear, but it is a very early model. Say 1976-ish. The 1980's belongs to the Shturmanskie with the 31659 movement. This is the air force version of the OKEAH in a way. 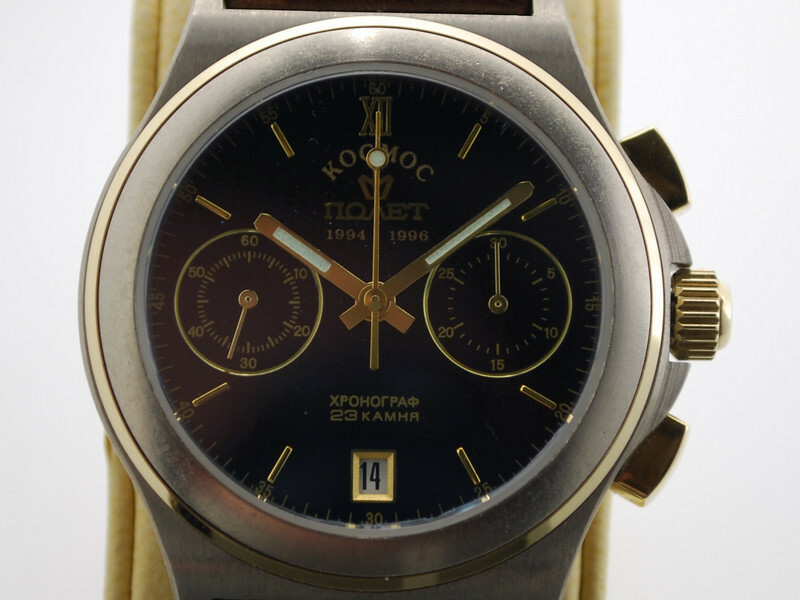 I am cheating a bit here, as this particular watch was made 1990, very close to the fall of the Soviet Union. The 1990's. 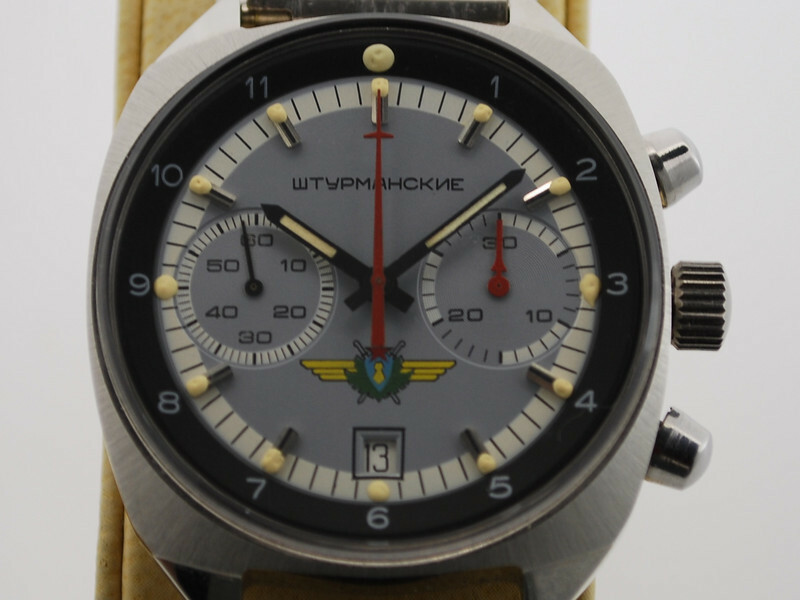 The Soviet Union is no more, and the same is true for military issued watches. The theme of the time was to look back on past glorious moments, and this watch is no exception. It commemorates the longest space flight in history. Titanium case. The grand finale. In 2005, Poljot (1MWF) celebrated 75 years as a watchmaker and made this special edition watch in a limited series of 250 pieces. Soon after, the Poljot factory was divided and partly sold out. By pure esthetic's, I regard this watch the most beautiful they ever made. 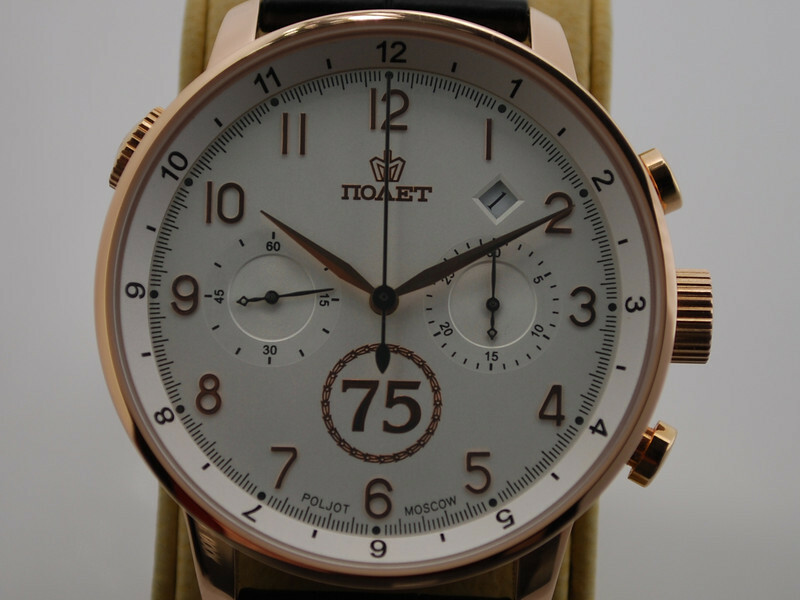 As you can see, the collection is clearly dominated by the First Moscow Watch Factory, later known as Poljot. That was not my initial intension, but instead a consequence of the theme itself. 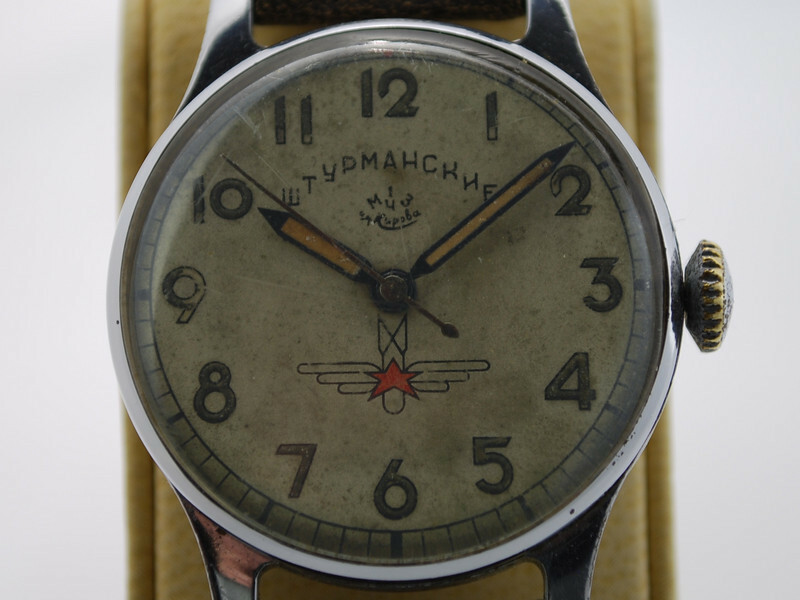 I like the Shturmanskie the history behind it.Being the first watch in space. The Shturmanskie was issued to graduated pilots in the Soviet air forces. Yuri Gagarin got his wings in a MIG-15 in 1957, so naturally, he brought his watch along on the space flight in 1961 despite the fact that watch was not specifically designed for space missions. So the Shturmanskie became the first watch ever on a space flight. However, the first watch in the actual vacuum of space, was the Strela in 1965, during Leonov's space walk. He is actually the most famous astronaut/cosmonaut still alive today. Last edited by Lucidor; 31-03-2010 at 19:38. Well, there's always an argument that the Strela didn't actually seen space, it was wore inside suit (from the Speedmasters die hards) and there wasn't any picture/photo of the Strela worn outside the suit. Frankly, will it make sense to wear your watch in your suit How do you tell time then ? Wonderful to see your full collection of Russians over the decades, Lars. They are all in such extraordinary condition too - I think you must have the best Okeah and Shturmanskie I have seen. 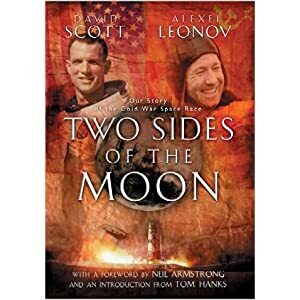 It's a personal account of the American and Soviet space progammes in the '60s and '70s. Conspiracy theorists believe that foul play was involved with Gagarin's fatal aircrash because he was too outspoken about the safety record of the Soviet space progamme. Yuri was a best friend of Alexei, who recognised and identified Gagarin's remains - the mole on the back of his neck which that very morning Alexei had told the barber to be careful about was the giveaway. No-one really knows what happened but favourite theory seems to be that he collided with a hot air balloon in the area, whose wreckage was also found later. Thank you StampeSV4, and interesting theories about Gagarin's crash. However, the fact that he was such a great asset to the Soviet propaganda machinery, makes any conspiracy theory a bit hard to believe. The recognition of his space flight was so enormous, it even took the Russians by surprise. They actually grounded him for many years, out of fear of loosing him in an accident. The OKEAH I presented in the lineup is very good, but I also have an absolute perfect one. Perfect in the sense that is is new old stock, with the original papers. It is a first generation version, which makes it quite rare. I usually wear all my watches, but I will make an exception with this one, and preserve it for the future. 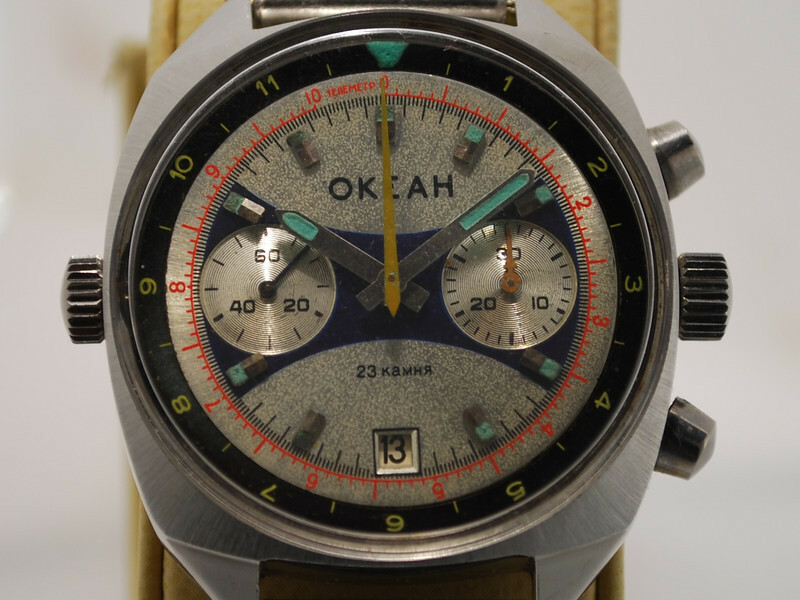 That Okeah is a real treasure - nowadays they so rarely seem to appear in NOS condition like yours with papers. My 31659 cal Sturmanskie has box, papers and steel bracelet but I still wear it occasionally. It's about to go on a black leather Di-Modell waterproof kalb strap.